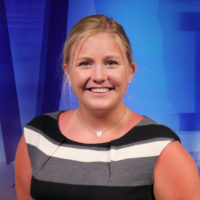 Rachel has been a News Reporter and Multimedia Journalist with Lakeland News since June of 2018. She reports on stories surrounding the Brainerd and North/Central Minnesota area. She was born and raised in Bemidji and is now excited to join the Brainerd community. Rachel worked in the Twin Cities at Hubbard Broadcasting in their Promotions Department for KS95 before moving to Brainerd and accepting the job at Lakeland News. She has interned at RP Broadcasting in Bemidji, working with programming and multimedia. Rachel is a 2017 graduate of the University of Minnesota, Twin Cities from the School of Journalism and Mass Communication. She attended high school in Bemidji, Minnesota and was a part of the Video Production program. In her spare time, Rachel enjoys spending time on the lake and hanging out with her golden retriever, Leo. She also loves traveling, music, and spending time with family and friends.